During the Great War, aircraft were used primarily for reconnaissance and artillery spotting. The Union of South Africa's First World War campaign in German South West Africa (GSWA) allowed for South Africa's first employment of military aeroplanes in conventional warfare. The creation and employment of the South African Aviation Corps (SAAC) within the Union Defence Force (UDF) provided ground forces with a substantial force multiplier in terms of forward reconnaissance. The aerial reconnaissance allowed General Louis Botha and his subordinate commanders to gain a better understanding of the tactical picture and facilitated the battle concept. This paper discusses the role and impact of aerial operations during the GSWA campaign. The campaign was characterised by sweeping envelopments which were executed by the Union's commandos. During the latter part of the campaign aeroplanes provided the UDF with intelligence in terms of the location and concentration of German forces, which assisted in their final encirclement. Keywords: German South West African campaign; Union Defence Force; airpower; First World War. Gedurende die Eerste Wêreldoorlog was vliegtuie hoofsaaklik gebruik vir verkenningsdoeleindes, en om vuurleiding te gee vir artillerie. Die eerste keer wat die Unie van Suid-Afrika militêre vliegtuie aangewend het in ŉ konvensionele rol, was tydens die veldtog in Duits Suidwes-Afrika (DSWA). Die stigting en operasionele aanwending van die Suid-Afrikaanse Vliegkorps, as deel van die Unieverdedigingsmag (UVM), het die magstruktuur en aanwending van die Suid-Afrikaanse troepe ter velde positief beïnvloed, veral in terme van die vergroting van die operasionele verkenningsektor. Sodoende het Generaal Louis Botha en sy stafoffisiere ŉ beter taktiese waardering van die gevegsfront gekry, wat ŉ daadwerklike invloed op die meegaande Suid-Afrikaanse gevegsontwerp gehad het. Hierdie artikel bespreek die rol en impak van lugoperasies tydens die veldtog in DSWA. Die veldtog was gekenmerk deur operasionele omsingelings wat op ŉ groot skaal uitgevoer was deur die UVM se kommando's. Teen die einde van die veldtog het lugverkenning gehelp om die ligging en sterkte van die Duitse magte vasgestel, wat die finale omsingelingsaanval van die UVM vergemaklik het. Sleutelwoorde: Duits Suidwes-Afrika veldtog; Unieverdedigingsmag; lugkrag; Eerste Wêreldoorlog. The industrial revolutions of the nineteenth and early twentieth century ushered in a new era of technological innovation that revolutionised the way war was fought. The early twentieth century brought forward scientific breakthroughs which saw warfare take to the skies. In August 1914, the First World War commenced and ground operations were focused on massing superior forces at critical points in attempts to invade or defend the respective territories. The use of aircraft in the German South West African campaign assisted the ground operations in providing up-to-date reconnaissance. During the First World War aerial reconnaissance was used to facilitate the operational planning process and the commander's decision-making cycle.8 The historiography of the campaign provides limited focus on the element of air operations. 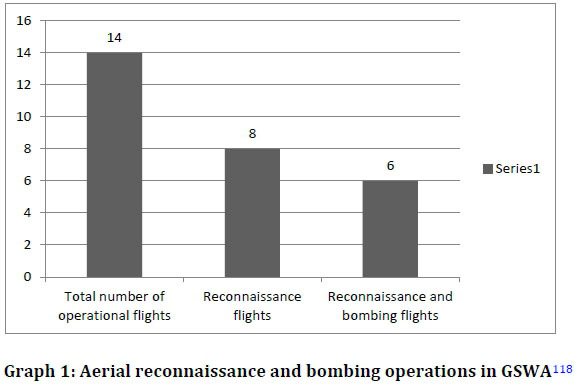 Despite the growing body of literature on the strategic operations and tactical aspects of the campaign, there are limited sources which provide in-depth analysis on the juxtaposition between ground and air operations in GSWA.15 This article aims to address the lack of focus on air operations by providing a detailed discussion on the use of aerial reconnaissance and rudimentary bombing missions in support of ground operations in GSWA in 1915. The development of the South African Aviation Corps (SAAC), which was established on 19 January 1915,16 was slower in comparison to that of the European powers that had to develop in accordance with the growing mobilisation of air assets. During 1915 military aviation, facilitated by new technological innovation, quickly developed the fighter plane and pilot.17 The narrative of airpower throughout history involves the central tenet of technological development and progress.18 The total mobilisation of the Great War resulted in a stalemate where numbers and mass were the main focus and appeared to be the only solution. 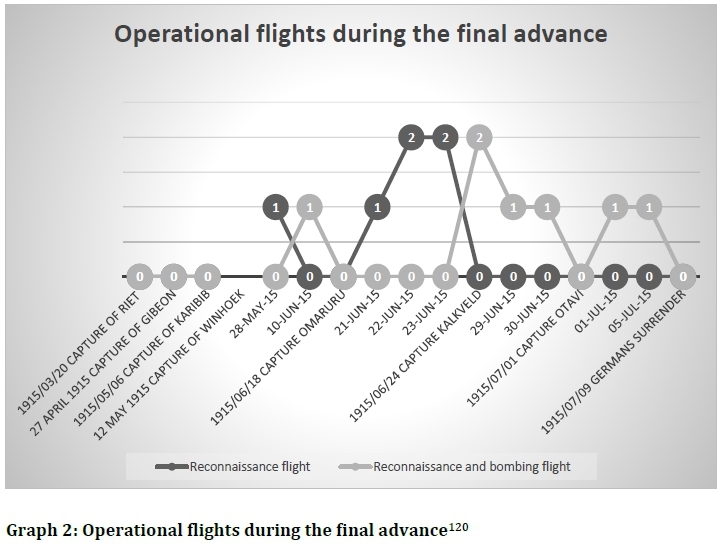 The application of airpower by the UDF during the campaign in GSWA was on a much lower and limited level when compared to that of the European theatre of operations which mirrored the intensity of the conflict. Airpower in GSWA was introduced as a means of aerial reconnaissance. This paper postulates that aerial reconnaissance in the campaign facilitated the offensive manoeuvres executed by the UDF which ultimately led to the surrender of the German forces. The article commences with a discussion on the context and background of airpower in South Africa, followed by a close examination on ground and air operations in the German South West African campaign. Amery was of the opinion that aeroplanes would be of far greater value in theatres of operations where there were not high concentrations of troops and where extended expanses of terrain and limited communications were combined with highly mobile operations.25 The GSWA campaign made for an interesting case study to test Amery's hypothesis because it proved to be one of manoeuvre and vast distances. 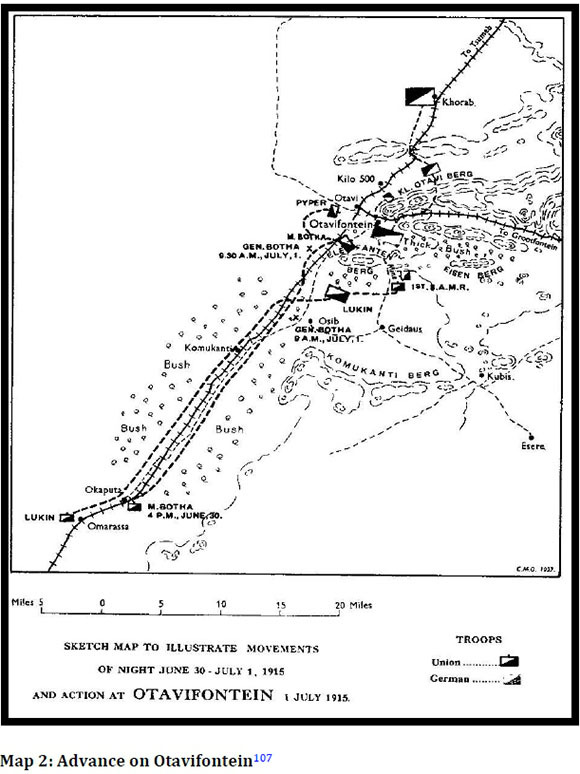 While locating the opposing force was central to tactical considerations, the pace of the campaign was greatly influenced by logistical considerations and the availability of water resources.31 The campaign was characterised by extensive and rapid manoeuvres which were followed by operational pauses which were used to regroup.32 Furthermore, the great expanses of GSWA were "mitigated" through the use of aerial reconnaissance which became a force multiplier. During early 1915 Turner and Emmet were sent to the Union of South Africa and GSWA respectively. Turner was assigned the task of recruiting further members for the embryonic Aviation Corps and Emmet was responsible for finding a suitable aerodrome in Swakopmund in GSWA.43 In terms of supporting staff, 34 mechanics were transferred from the Royal Naval Air Service to the Union of South Africa.44 The preliminary staff was supplemented by additional pilots and supporting personnel such as observers and logistical administrators. The SAAC initially comprised four Henri Farmans F-27 and two Blériot Experimental model 2C (B.E.2c) planes. The remaining staff and four of the six aeroplanes (two B.E.2cs and two Henri Farman F-27s) arrived by ship in Walvis Bay on 30 April 1915 and the aircraft were disembarked on 1 May 1915. Two of the Henri Farman's had been damaged as a result of the sea voyage. The first test flight was taken by Van der Spuy in one of the B.E.2c planes on 4 May,45 after which the other B.E.2c was tested on 5 May. Both aircraft were declared combat ready by 7 May 1915.46 The first planned task for the newly formed aviation corps was to support operations against Karibib, however the UDF captured Karibib before the SAAC could conduct any reconnaissance missions over the town. 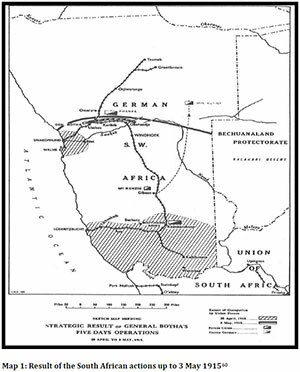 The invasion of German South West Africa was initiated in September 1914. The first attempts at invading the country was a cross-border advance which culminated in a bloody nose for the UDF at the Battle of Sandfontein.47 The Union of South Africa's entry into the First World War ignited predisposing tensions within the Afrikaner demographic which triggered the Afrikaner Rebellion.48 Many Afrikaners did not identify with the British cause and imperial objectives.49 The UDF's campaign in GSWA was thus placed on hold until the rebellion was effectively quelled in late 1914. The operational plan for the advance and invasion of the southern part of GSWA comprised the divergent advances of three different force groupings. The Southern Force landed at Lüderitzbucht, while the Central and Eastern Forces respectively crossed the northern border of the Union of South Africa, upon which they entered GSWA. 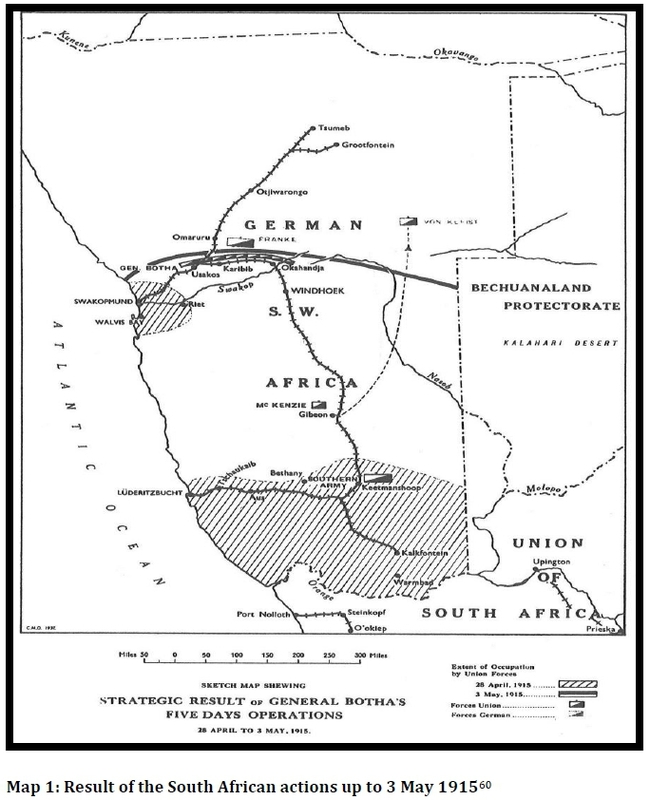 These three forces constituted the Southern Army and their operations resulted in the capture of Keetmanshoop which restricted the rail movement of the German forces in the south and forced them to the north of the colony. Operations in the south of GSWA were concluded with the Battle of Gibeon and the UDF prisoners of war there were released.51 Map 1 below indicates the impact of the initial operations in GSWA until the start of May 1915. On 30 June a reconnaissance flight was sent out to Otavi which dropped its payload on the German position. A subsequent flight was sent out to determine the location of Myburgh's forces that had lost contact with Botha.103 The intelligence report provided no concrete information on the location of the 2nd Mounted Brigade but unequivocally confirmed the presence of German forces in and around Otavi and Otavifontein. Botha and the Union forces departed for Otavi and Otavifontein on the night of 30 June and carried out the advance through to the early hours of 1 July 1915.104 Manie Botha led the attack on the German position at Otavifontein105 and following a brief engagement, the Germans forces withdrew to Grootfontein.106 Map 2 indicates the advance on Otavifontein. On 1 July 1915, Creed conducted a reconnaissance and aerial bombardment of the German forces at Khorab. An aerial reconnaissance on 5 July located German forces in and around Tsumeb. The reconnaissance flight doubled up as an aerial bombing mission where the aircraft fired its payload.110 The reconnaissance aimed to facilitate ground operations by confirming the final location of German forces. The UDF made use of aeroplanes for reconnaissance and rudimentary aerial bombardment during the Union of South Africa's First World War campaign in GSWA. The arrival of aeroplanes in the theatre of operations on 1 May 1915 allowed for the Union of South Africa's first deployment of military aeroplanes in conventional operations. The use of aircraft allowed the UDF to "find" the German forces which facilitated the mobile UDF elements attempts to "fix" the German forces by enveloping manoeuvres. The Germans traded space for time with their numerically inferior forces and constantly retreated. The UDF finally managed to surround the German forces completely at Khorab, inducing their surrender. The use of aeroplanes allowed the UDF commanders to understand the intelligence picture better and this facilitated the deployment of the Union's forces (refer to Table 1). Knowledge of the location of the German forces expedited the timely execution of the operational plan and the battle concept. There were two reconnaissance flights taken over Omaruru prior to the UDF's advance. These flights confirmed the German withdrawal from their defensive positions and allowed the Union forces to advance with confidence and speed. The UDF advanced on Omaruru on 18 June and captured it on 19 June 1915. 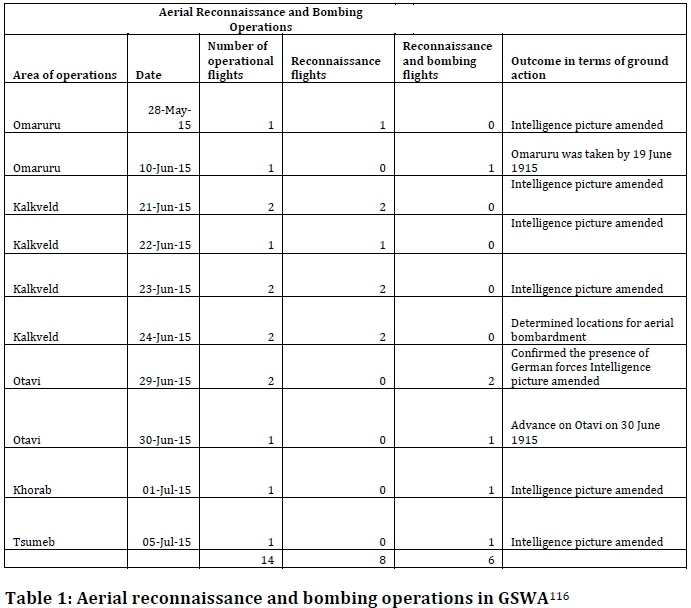 Aerial operations in the GSWA campaign comprised 14 flights in direct support of ground operations (refer to Table 1 and Graph 1). The flights provided the UDF command with reconnaissance which assisted in their decision making process in terms of where and when to deploy. Botha was of the opinion that current intelligence of where the German force was positioned allowed the UDF to deploy with the minimum required number of troops.117 The concept of advancing with a given amount of troops relates to the availability of logistics to keep one's own forces in the field and the availability of real time intelligence of enemy quantities and positions. Botha gives credit to his subordinate commanders in the execution of their sweeping envelopments of the German forces and describes the reason for the rapid victory as the impact of surprise on the German forces.119 The final advance commenced on 18 June, after which Omaruru was taken on 19 June, followed by Kalkveld on 24 June and Otavi on 1 July 1915. Because the German positions (mentioned above) were captured by the UDF, the Aviation Corps advanced with the ground forces and prepared aerodromes at the respective positions which allowed for the forward projection of airpower throughout the advance (refer to Graph 2). The number of aerial reconnaissance flights increased in line with the requirements of the UDF's advance. Following the culmination of the German South West African campaign the SAAC went on to become 26 Squadron of the Royal Air Force and served in the German East African campaign and on the Western Front. Van der Spuy served with distinction in both World Wars and retired with the rank of major general. * An earlier version of this paper was presented at the Great War in Africa Conference, hosted by Stellenbosch University in 2015. He is currently preparing a publication, The First Campaign Victory of the Great War (Helion Publishers, Solihull, forthcoming, 2019). Email address: antoniogarcia81@yahoo.com. I would like to thank Evert Kleynhans and Will Gordon for their assistance in translating the abstract of this paper into Afrikaans. 1. D.E. Showalter, "Manoeuvre Warfare: The Eastern and Western Fronts", in H. Strachan, (ed. ), The Oxford Illustrated History of the First World War (Oxford University Press, Oxford, 1998), p 46. 2. D.T. Zabecki, The German 1918 Offensives: A Case Study in the Operational Level of War (Routledge, New York, 2006), p 46. 3. A. Whitmarsh, "British Army Manoeuvres and the Development of Military Airpower 1910-1913", War in History, 14, 3 (2007), p 325. 4. J.H. Morrow, "The War in the Air", in *Strachan, Oxford Illustrated History, p 268; C. Blount, "Modern Airpower and the 1916 Arab Revolt: What can the Modern Airman do to Counter Lawrence of Arabia", Air and Space Power Journal, 23, 3 (2009), p 21. 5. G. L'ange, Urgent Imperial Service (Ashanti, Johannesburg, 1991), p 7. 6. Department of Defence Archives (hereafter DOD Archives), Diverse (hereafter D), Box 8, 37, Report on the Military Situation in South Africa, 20 August 1910. 7. See, A. Garcia, 'A Manoeuvre Warfare Analysis of South Africa's 1914-1915 German South West African Campaign', Scientia Militaria, 45, 1 (2017). 8. J. Steckfuss, Eyes All over the Sky: Aerial Reconnaissance in the First World War (Casemate, Oxford, 2016), p 2. 9. See, for example Anon., Union of South Africa and the Great War, 1914-1918: Official History (Government Printer, Pretoria, 1924); J.J. Collyer, The Campaign in German South West Africa, 1914-1915 (Government Printer, Pretoria, 1937); H.F. Trew, Botha Treks (Blackie & Son, London, 1936); M.E. Ritchie, With Botha in the Field (Longmans, London, 1915); W. Whittal, With Botha and Smuts in Africa (London: Cassell, 1917); H.F.B. Walker, A Doctor's Diary in Damaraland (Edward Arnold, London, 1917); D.E. Reitz, Trekking On (Travel Book Club, London, 1947); P.K.J. Robinson, With Botha's Army (Allen & Unwin, London, 1916); E. Dane, British Campaigns in Africa and the Pacific 1914-1918 (Hodder & Stoughton, London, 1919); W.W. O'Shaughnessy and W.S. Rayner, How Botha and Smuts Conquered German South West (Simpkin, London, 1916). 10. See, L'ange, Urgent Imperial Service; B. Nasson, Springboks on the Somme (Penguin, Johannesburg, 2007); T. Couzens, The Great Silence (Sunday Times, Johannesburg: 2014); A.M. Grundlingh, Fighting Their Own War: South African Blacks and the First World War (Ravan Press, Johannesburg, 1988); J. Stejskal, The Horns of the Beast: The Swakop River Campaign and World War I in South West Africa, 1914-1915 (Helion, Solihull, 2014); I. Gleeson, The Unknown Force: Black, Indian and Coloured Soldiers through Two World Wars (Ashanti, Johannesburg, 1994); D. Williams, Springboks, Troepies and Cadres: Stories of the South African Army 1912-2012 (Tafelberg, Cape Town, 2012); A. Cruise, Louis Botha's War: The Campaign in German South West Africa 1914-1915 (Zebra, Cape Town, 2015); H. Strachan, The First World War, Vol 1: To Arms (Oxford University Press, Oxford, 2001); T.R. Ungleich, "The Defence of German South West Africa during World War I", MA thesis, University of Miami, 1974; B. Farwell, The Great War in Africa 1914-1918 (Norton, New York, 1986); I. Van der Waag, A Military History of Modern South Africa (Jonathan Ball, Johannesburg, 2015); A. Delport, '"Boks and Bullets, Coffins and Crutches': An Exploration of the Body, Mind and Places of 'Springbok' South African Soldiers in the First World War", MA dissertation, Stellenbosch, 2015; B. Nasson, World War 1 and the People of South Africa (Tafelberg, Cape Town, 2014); A. Samson, World War I in Africa: The Forgotten Conflict among European Powers (I.B. Taurus, London, 2013). 11. R.C. Warwick, "The Battle of Sandfontein: The Role and Legacy of Major General Sir Henry Timson Lukin", Scientia Militaria, SA Journal of Military Studies, 34, 2 (2006); I. Van der Waag, "The Battle of Sandfontein, 26 September 1914: South African Military Reform and the German South West Africa Campaign, 1914-1915", First World War Studies, 4, 2 (2013); E. Kleynhans, "A Critical Analysis of the Impact of Water on the South African Campaign in German South West Africa, 1914-1915", Historia, 61, 2 (2016); A. Garcia, "Manoeuvre Warfare in the South African Campaign in German South West Africa during the First World War", MA dissertation, University of South Africa, 2015. 12. See A. Grundlingh, Participation and Remembrance: South African Black and Coloured Troops in the First World War, 1914-1918 (Sun Press, Stellenbosch, 2014); B. Nasson, "Delville Wood and South African Great War Commemoration", English Historical Review, 119, 480 (2004); Gleeson, The Unknown Force; W.M. Bisset, 'Unexplored Aspects of South Africa's First World War History', Scientia Militaria, 6, 3 (1976). A.I. Venter, Coloured: A Profile of Two Million South Africans in Cape Town (Human & Rousseau, Cape Town, 1974); Grundlingh, Fighting Their Own War; I.D Difford, The Story of the 1st Battalion Cape Corps, 1915-1919 (Hortons, Cape Town, 1920); DOD Archives, Box 2517, South African Native Labour Contingent, Commemoration of the 'missing' SANLC, 1926. 13. DOD Archives, Adjutant General (hereafter AG), 1914-1921, G/42/25, Correspondence with Defence Headquarters regarding allocation of batmen, 1914; DOD Archives, Secretary of Defence (hereafter SD), Box 252, Strength of Units 'Natives' attached to the various Brigades, July 1915. 14. DOD Archives, SD, Box 252, Strength of Units during the Final Advance in German South West Africa, July 1915. 15. W.A. Raleigh and H.A. Jones, The War in the Air: Being the Story of the Part Played in the Great of the Royal Air Force (Oxford: Clarendon Press, Oxford, 1922); S. Monick, "The Third Man: Willy Trück and the German Air Effort in South West Africa in World War I", Military History Journal, 5, 3 (1981); J.O.E.O. Mahncke, "Aircraft Operations in the German Colonies, 1911-1916: The Fliegertruppe of the Imperial German Army", Military History Journal, 12, 2 (2001); K.R. Van der Spuy, Chasing the Wind (Books of Africa, Cape Town, 1966); T. Dedering, "Air Power in South Africa, 1914-1939", Journal of Southern African Studies, 31, 3 (2015). 16. The South African Air Force was established on 1 February 1920. 17. Morrow, "The War in the Air", in Strachan, Oxford Illustrated History, p 269. 18. S.H. Lukasik, "Insurgent Airpower in Historical Perspective: An Introduction and Prospectus of Research", The Historian, 74, 2 (2012), p 225. 19. Whitmarsh, "British Army Manoeuvres", p 327. 20. Leo Amery was a war correspondent during the South African War. He later edited the Times History of the South African War. 21. K.P. Epstein, "Imperial Airs: Leo Amery, Airpower and Airpower, 1873-1945", The Journal of Imperial and Commonwealth History, 38, 4 (2010), p 575. 22. J.A. Hennessy, "Men and Planes of World War 1 and History of Lafayette Escadrille", Air Power History, 61, 2 (2014), p 21. 23. A.D. Harvey, "Air Warfare in Perspective", Air Power History, 60, 3, 2013, p 9. 24. Monick, "The Third Man", p 1; Mahncke, "Aircraft Operations in the German Colonies", p 2; Trew, Botha Treks, p 152; L'ange, Urgent Imperial Service, p 118. 25. Epstein, "Imperial Airs", p 578, p 579. 26. Blount, "Modern Airpower and the 1916 Arab Revolt", p 53. 27. Botha was the prime minister of the Union of South Africa and the commander-in-chief of the Union expeditionary force in GSWA. 28. L'ange, Urgent Imperial Service, p 267. 29. Commandos were Afrikaner irregular military units in South Africa. They were characterised as having good tactical initiative, marksmanship and equestrian skills despite being undisciplined. 30. Nasson, Springboks on the Somme, pp 63-65. 31. Kleynhans, "A Critical Analysis", p 50. 32. Garcia, "Manoeuvre Warfare", p 113. 33. Smuts was Botha's friend, partner and confidant in political as well as military affairs. Smuts became the minister of defence, mines and interior in 1910. 34. L'ange, Urgent Imperial Service, p 268, p 269. 35. In 1917 Smuts had become a member of the British War Cabinet and promoted the Air Force as a separate wing, removed from the Army. Leo Amery suggested to Smuts that the Air Force should have a separate and independent staff. Smuts and Amery had become friends during the South African War. See Epstein, "Imperial Airs", p 577. 36. Hennessy, "Men and Planes of World War 1", p 16. 37. Mahncke, "Aircraft Operations in the German Colonies", pp 1, 2; DOD Archives, World War 1 Diaries (hereafter WW1 WD), Box 2, Air/1/1247/204/7/4, Historical record of No. 26 (SA) Squadron and South African Aviation Corps; and Historical record of the South Africa unit of the Royal Flying Corps; L'ange, Urgent Imperial Service, p 269. 38. See, D.P. Tidy, "They Mounted up as Eagles: A Brief Tribute to the South African Air Force", The Military History Journal, 5, 6 (1982). 39. L'ange, Urgent Imperial Service, p 273. 40. DOD Archives, WW1 WD, Box 1, Air 1/1247/204/7/1, Report by Major Wallace on the campaign in German South West Africa, 1915, 21 July 1916; L'ange, Urgent Imperial Service, p 269. 41. DOD Archives, WW1 WD, Box 1, Air 1/1247/204/7/1, Vol. 3, Aviation report on German South West Africa April 1915-1916, War Diary. 42. DOD Archives, WW1 WD, Box 1, Air 1/1247/204/7/1, Report by Major Wallace on the campaign in German South West Africa, 1915, 21 July 1916. 43. DOD Archives, WW1 WD, Box 1, Air 1/1247/204/7/1, Report by Major Wallace on the campaign in German South West Africa, 1915, 21 July 1916; L'ange, Urgent Imperial Service, p 269. 44. DOD Archives, WW1 WD, Box 2, Air/1/1247/204/7/4, Historical record of No. 26 (SA) Squadron and South African Aviation Corps; and Historical record of the South African unit of Royal Flying Corps; DOD Archives, WW1 WD, Box 1, Air 1/1247/204/7/1, Report by Major Wallace on the campaign in GSWA, 1915, 21 July 1916. 45. DOD Archives, WW1 WD, Box 1, Air 1/1247/204/7/1, Vol. 3, Aviation report on German South West Africa April 1915-1916, War Diary. 46. DOD Archives, WW1 WD, Box 1, Air 1/1247/204/7/1, Report by Major Wallace on the campaign in GSWA, 1915, 21 July 1916. Mahncke gives the first reconnaissance flight on 6 May 1915, see his "Aircraft Operations in the German Colonies", p 3. However, this flight may have indeed been a test flight. 47. For discussion on the Battle of Sandfontein, see Warwick, "The Role and Legacy; and Van der Waag, "The Battle of Sandfontein". 48. Van der Waag, "The Battle of Sandfontein", p 7. See also S. Swart, "The 'Five Shilling Rebellion': Rural White Male Anxiety and the 1914 Boer Rebellion", South African Historical Journal, 56, 1 (2006); and S. Swart, "'Desperate Men' The 1914 Rebellion and the Polities of Poverty", South African Historical Journal, 42, 1 (2000); S. Swart, "'A Boer and his Gun and his Wife are Three Things Always Together': Republican Masculinity and the 1914 Rebellion", Journal of Southern African Studies, 24, 4 (2008). 49. Nasson, Springboks on the Somme, p 10. 50. DOD Archives, Adjutant General (hereafter AG), 1914-1921, Box 8, G5/305/9199, Commander-in-chief, Government notice for the next issue of the Union Gazette, 18 October 1914. 51. W.A. Dorning, "A Concise History of the South African Defence Force 1912-1987", Militaria, South African Journal for Military Studies, 17, 2 (1987), p 4. 52. L'ange, Urgent Imperial Service, p 244; Anon., Official History, p 32; Whittal, With Botha and Smuts, p 137; Collyer, The Campaign in German South West Africa, 1914-1915, p 23; Kleynhans, "A Critical Analysis", pp 41, 42. 53. Dorning, "A Concise History", p 4. 54. Nasson, Springboks on the Somme, p 74; Anon., Official History, p 40; J. Meintjes, General Louis Botha (Cassel, London, 1970), p 264; Whittal, With Botha and Smuts, p 62; H. Paterson, "First Allied Victory: The South African Campaign in German South-West Africa, 1914-1915", Military History Journal, 13, 2 (2004), p 6. 55. Strachan, The First World War, p 565; Anon., Official History, p 32. 56. The United Kingdom National Archives (hereafter TNA), ADM 123/144, War Records 1914-1918, General Letters and Proceedings, Walvis Bay, May 1915; DOD Archives, WW1 WD, Box 1, Air 1/1247/204/7/1, Vol. 2, Aviation report on German South West Africa April 1915-1916, Report of Transport Officer; DOD Archives, WW1 WD, Box 1, Air 1/1247/204/7/1, Vol. 10, Aviation report on German South West Africa April 1915-1916, Diary No, 2 kept by Lieutenant Carey-Thomas; DOD Archives, WW1 WD, Box 1, Air 1/1247/204/7/1, Report by Major Wallace on the campaign in German South West Africa, 1915, 21 July 1916. 57. South African National Archives (hereafter SANA), Smuts Papers, Box 112, Major General Thompson: Report on a visit to German South West Africa, 20-27 March 1915. 58. DOD Archives, WW1 WD, Box 1, Air 1/1247/204/7/1, Report by Major Wallace on the campaign in German South West Africa, 1915, 21 July 1916. 59. DOD Archives, WW1 WD, Box 1, Air 1/1247/204/7/1, Vol. 2, Aviation report on German South West Africa, April 1915-1916, Report of Transport Officer. 60. Collyer, The Campaign in German South West Africa, opposite p 105. 61. DOD Archives, WW1 WD, Box 1, Air 1/1247/204/7/1, Vol. 2, Aviation report on German South West Africa, April 1915-1916, Report of Transport Officer. 62. DOD Archives, WW1 WD, Box 1, Air 1/1247/204/7/1, Vol. 10, Aviation report on German South West Africa April 1915-1916, Diary No. 2 kept by Lieutenant Carey-Thomas. 63. DOD Archives, SD, Box 252, 17138, Reports of Force Commanders in German South West Africa, Despatch No. 4 by General Botha covering the period 15 May to 18 July 1915. 64. DOD Archives, WW1 WD, Box 1, Air 1/1247/204/7/1, Report by Major Wallace on the campaign in German South West Africa, 1915, 21 July 1916; DOD Archives, WW1 WD, Box 1, Air 1/1247/204/7/1, Vol. 3, Aviation report on German South West Africa April 1915-1916, War Diary. 65. DOD Archives, WW1 WD, Box 1, Air 1/1247/204/7/1, Vol. 10, Aviation report on German South West Africa, April 1915-1916, Diary No. 2 kept by Lieutenant Carey-Thomas; DOD Archives, WW1 WD, Box 1, Air 1/1247/204/7/1, Report by Major Wallace on the campaign in German South West Africa, 1915, 21 July 1916. 66. DOD Archives, WW1 WD, Box 1, Air 1/1247/204/7/1, Report by Major Wallace on the campaign in German South West Africa, 1915, 21 July 1916. 67. L'ange, Urgent Imperial Service, p 118. 68. Mahncke, "Aircraft Operations in the German Colonies", p 1. 69. Monick, "The Third Man", p 1. 70. L'ange, Urgent Imperial Service, pp 268, 269. 71. DOD Archives, WW1 WD, Box 1, Air 1/1247/204/7/1, Vol. 10, Aviation report on German South West Africa, April 1915-1916, Diary No. 2 kept by Lieutenant Carey-Thomas. 72. Hennessy, "Men and Planes of World War 1", p 21. 73. DOD Archives, WW1 WD, Box 1, Air 1/1247/204/7/1, Vol. 3, Aviation report on German South West Africa, April 1915-1916, War Diary. 74. D.R. Baucom, "Wakes of War: Contrails and the Rise of Air Power 1918-1945, Part 1, Early Sightings and Preliminary Explanations, 1918-1938", Air Power History, 54, 2 (2007), p 18. 75. DOD Archives, WW1 WD, Box 1, Air 1/1247/204/7/1, Vol. 10, Aviation report on German South West Africa, April 1915-1916, Diary No. 2 kept by Lieutenant Carey-Thomas. 76. DOD Archives, WW1 WD, Box 1, Air 1/1247/204/7/1, Report by Major Wallace on the campaign in German South West Africa, 1915, 21 July 1916; DOD Archives, WW1 WD, Box 1, Air 1/1247/204/7/1, Vol 10, Aviation report on German South West Africa, April 1915-1916, Diary No. 2 kept by Lieutenant Carey-Thomas. 77. DOD Archives, SD, Box 252, 17138, Reports of Force Commanders in German South West Africa, Despatch No. 4 by General Botha covering the period 15 May to 18 July 1915; L'ange, Urgent Imperial Service, p 264. 78. DOD Archives, SD, Box 252, 17138, Reports of Force Commanders in German South West Africa, Despatch No. 4 by General Botha covering the period 15 May to 18 July 1915. 79. TNA, War Cabinet (hereafter CAB) 45/112, The Campaign in German South West Africa. 1914-1918, Narrative of Events, 21 June 1915. 80. DOD Archives, WW1 WD, Box 1, Air 1/1247/204/7/1, Vol. 10, Aviation report on German South West Africa, April 1915-1916, Diary No. 2 kept by Lieutenant Carey-Thomas; DOD Archives, WW1 WD, Box 1, Air 1/1247/204/7/1, Vol. 3, Aviation report on German South West Africa, April 1915-1916, War Diary; DOD Archives, WW1 WD, Box 1, Air 1/1247/204/7/1, Report by Major Wallace on the campaign in German South West Africa, 1915, 21 July 1916. 81. DOD Archives, WW1 WD, Box 1, Air 1/1247/204/7/1, Vol. 2, Aviation report on German South West Africa, April 1915-1916, Report of Transport Officer. 82. DOD Archives, SD, Box 252, 17138, Reports of Force Commanders in German South West Africa, Despatch No. 4 by General Botha, covering the period 15 May to 18 July 1915. 83. Ritchie, With Botha in the Field, p 55. Whittal gives the date as 20 June, see With Botha and Smuts in Africa, p 104. 84. DOD Archives, WW1 WD, Box 1, Air 1/1247/204/7/1, Report by Major Wallace on the campaign in German South West Africa, 1915, 21 July 1916. 85. DOD Archives, WW1 WD, Box 1, Air 1/1247/204/7/1, Vol. 3, Aviation report on German South West Africa April 1915-1916, War Diary; DOD Archives, WW1 WD, Box 1, Air 1/1247/204/7/1, Vol. 10, Aviation report on German South West Africa, April 1915-1916, Diary No. 2 kept by Lieutenant Carey-Thomas. 86. DOD Archives, WW1 WD, Box 1, Air 1/1247/204/7/1, Report by Major Wallace on the campaign in German South West Africa, 1915, 21 July 1916. 87. DOD Archives, WW1 WD, Box 1, Air 1/1247/204/7/1, Report by Major Wallace on the campaign in German South West Africa, 1915, 21 July 1916. 88. DOD Archives, SD, Box 252, 17138, Reports of Force Commanders in German South West Africa, Despatch No. 4 by General Botha, covering the period 15 May to 18 July 1915; DOD Archives, WW1 WD, Box 1, Air 1/1247/204/7/1, Vol. 3, Aviation report on German South West Africa, April 1915-1916, War Diary. 89. DOD Archives, WW1 WD, Box 1, Air 1/1247/204/7/1, Report by Major Wallace on the campaign in German South West Africa, 1915, 21 July 1916; DOD Archives, WW1 WD, Box 1, Air 1/1247/204/7/1, Vol. 3, Aviation report on German South West Africa April 1915-1916, War Diary. 90. DOD Archives, WW1 WD, Box 1, Air 1/1247/204/7/1, Vol. 3, Aviation report on German South West Africa, April 1915-1916, War Diary. 91. DOD Archives, SD, Box 252, 17138, Reports of Force Commanders in German South West Africa, Despatch no. 4 by General Botha, 15 May to 18 July 1915. 92. DOD Archives, WW1 WD, Box 1, Air 1/1247/204/7/1, Report by Major Wallace on the campaign in German South West Africa, 1915, 21 July 1916; DOD Archives, WW1 WD, Box 1, Air 1/1247/204/7/1, Vol. 3, Aviation report on German South West Africa, April 1915-1916, War Diary. 93. DOD Archives, WW1 WD, Box 1, Air 1/1247/204/7/1, Vol. 3, Aviation report on German South West Africa April 1915-1916, War Diary. 94. DOD Archives, WW1 WD, Box 1, Air 1/1247/204/7/1, Report by Major Wallace on the campaign in German South West Africa, 1915, 21 July 1916. 95. DOD Archives, SD, Box 252, 17138, Reports of Force Commanders in German South West Africa, Despatch No 4 by General Botha covering the period 15 May to 18 July 1915. 96. TNA, CAB 45/112, The Campaign in German South West Africa 1914-1918, Narrative of Events, 24 June 1915. 97. DOD Archives, WW1 WD, Box 1, Air 1/1247/204/7/1, Report by Major Wallace on the campaign in German South West Africa, 1915, 21 July 1916. 98. Van der Spuy, Chasing the Wind, p 81. 99. DOD Archives, WW1 WD, Box 1, Air 1/1247/204/7/1, Vol. 3, Aviation report on German South West Africa, April 1915-1916, War Diary; DOD Archives, WW1 WD, Box 1, Air 1/1247/204/7/1, Vol. 10, Aviation report on German South West Africa, April 1915-1916, Diary No. 2 kept by Lieutenant Carey-Thomas. 100. DOD Archives, WW1 WD, Box 1, Air 1/1247/204/7/1, Report by Major Wallace on the campaign in German South West Africa, 1915, 21 July 1916. 101. TNA, CAB 45/112, The Campaign in GSWA, 1914-1918, Narrative of Events, 1 July 1915; DOD Archives, WW1 WD, Box 1, Air 1/1247/204/7/1, Vol. 3, Aviation report on GSWA April 1915-1916, War Diary; DOD Archives, WW1 WD, Box 1, Air 1/1247/204/7/1, Report by Major Wallace on the campaign in German South West Africa, 1915, 21 July 1916; DOD Archives, WW1 WD, Box 1, Air 1/1247/204/7/1, Vol. 10, Aviation report on German South West Africa, April 1915-1916, Diary No. 2 kept by Lieutenant Carey-Thomas; DOD Archives, SD, Box 252, 17138, Reports of Force Commanders in German South West Africa, Despatch No. 4 by General Botha covering the period 15 May to 18 July 1915. 102. L'ange, Urgent Imperial Service, p 288. 103. DOD Archives, SD, Box 252, 17138, Reports of Force Commanders in GSWA, Despatch No. 4 by General Botha covering the period 15 May to 18 July 1915; DOD Archives, WW1 WD, Box 1, Air 1/1247/204/7/1, Vol. 3, Aviation report on German South West Africa April 1915-1916, War Diary; Garcia, "A Manoeuvre Warfare Analysis", p 109. 104. DOD Archives, SD, Box 252, 17138, Reports of Force Commanders in GSWA, Despatch No. 4 by General Botha, 15 May to 18 July 1915; Collyer, The Campaign in German South West Africa, 1914-1915, p 137; L'ange, Urgent Imperial Service, p 291; Whittal, With Botha and Smuts in Africa, p 147. 105. DOD Archives, SD, Box 252, 17138, Reports of Force Commanders in GSWA, Despatch No. 4 by General Botha, 15 May to 18 July 1915; Ritchie, With Botha in the Field, p 59. 106. TNA, CAB 45/112, Campaign in GSWA 1914-1918, Narrative of Events, 3 July 1915. 107. Collyer, The Campaign in German South West Africa, 1914-1915, opposite p 137. 108. DOD Archives, SD, Box 252, 17138, Reports of Force Commanders in German South West Africa, Despatch No. 4 by General Botha covering the period 15 May to 18 July 1915. 109. Anon., Official History, p 46. 110. DOD Archives, WW1 WD, Box 1, Air 1/1247/204/7/1, Report by Major Wallace on the campaign in German South West Africa, 1915, 21 July 1916; DOD Archives, WW1 WD, Box 1, Air 1/1247/204/7/1, Vol. 10, Aviation report on German South West Africa, April 1915-1916, Diary 2 kept by Lieutenant Carey-Thomas. 111. TNA, CAB 45/112, The Campaign in German South West Africa 1914-1918, Narrative of Events, 8 July 1915; Anon., Official History, p 40. Whittal says that the South African forces were ready to attack Tsumeb on 5 July and the town subsequently surrendered. See Whittal, With Botha and Smuts in Africa, p 152. 112. Meintjes, General Louis Botha, p 269. 113. DOD Archives, SD, Box 252, 17138, Reports of Force Commanders in German South West Africa, Despatch No. 4 by General Botha covering the period 15 May to 18 July 1915; Meintjes, General Louis Botha, p 262; Trew, Botha Treks, p 175. 114. Meintjes, General Louis Botha, p 262; Trew, Botha Treks, p 175. 115. TNA, CAB 45/112, The Campaign in German South West Africa 1914-1918, Narrative of Events, 9 July 1915. 116. DOD Archives, WW1 WD, Box 1, Air 1/1247/204/7/1, Vol. 10, Aviation report on German South West Africa, April 1915-1916, Diary No. 2 kept by Lieutenant Carey-Thomas; DOD Archives, WW1 WD, Box 1, Air 1/1247/204/7/1, Vol 3, Aviation report on German South West Africa, April 1915-1916, War Diary; DOD Archives, WW1 WD, Box 1, Air 1/1247/204/7/1, Report by Major Wallace on the campaign in German South West Africa, 1915, 21 July 1916. 117. DOD Archives, SD, Box 252, 17138, Reports of Force Commanders in German South West Africa, Despatch No. 4 by General Botha covering the period 15 May to 18 July 1915. 118. DOD Archives, WW1 WD, Box 1, Air 1/1247/204/7/1, Vol. 10, Aviation report on German South West Africa, April 1915-1916, Diary No. 2 kept by Lieutenant Carey-Thomas; DOD Archives, WW1 WD, Box 1, Air 1/1247/204/7/1, Vol. 3, Aviation report on German South West Africa, April 1915-1916, War Diary; DOD Archives, WW1 WD, Box 1, Air 1/1247/204/7/1, Report by Major Wallace on the campaign in German South West Africa, 1915, 21 July 1916. 119. DOD Archives, World War 1, German South West Africa (hereafter WW1 GSWA), Box 23a, Citations, German South West Africa, Northern Army, Commander of the 1st Mounted Brigade Special Appointments, 17 February 1918. 120. DOD Archives, WW1 WD, Box 1, Air 1/1247/204/7/1, Vol. 10, Aviation report on German South West Africa April 1915-1916, Diary No. 2 kept by Lieutenant Carey-Thomas; DOD ArchiveWW1 WD, Box 1, Air 1/1247/204/7/1, Vol. 3, Aviation report on German South West Africa, April 1915-1916, War Diary; DOD Archives, WW1 WD, Box 1, Air 1/1247/204/7/1, Report by Major Wallace on the campaign in German South West Africa, 1915, 21 July 1916. 121. Van der Spuy, Chasing the Wind, p 82; L'ange, Urgent Imperial Service, p 273. 122. Ritchie, With Botha in the Field, p 56.